Last month my empties were pretty average but this month is going to be a little bit disappointing because I just didn’t get to use up as many products as I typically do, I’m not sure why but I guess I was just slacking this month. I do have a few things this month to share but it’s really not that many. It is that time to talk about all of my used up products, some of the most fun posts are these I think. I just think it’s really satisfying to use up a product and to read about a product someone used up because they really used it up and can say that they’ve formed a really proper opinion about a product when you use it up. So, I think it is safe to say that I have an opinion about all of these products, let’s jump in to talking about the products I’ve used up. It’s time for yet another empties post, the first one of the year and it’s going to be an average empties post really, I have a fair amount of products but nothing crazy. I have been keeping up the pace with going through products and getting them out, which is a huge goal that I have for this year, I really want to use and enjoy my hoard of things, so hopefully, these empties posts will stay interesting. 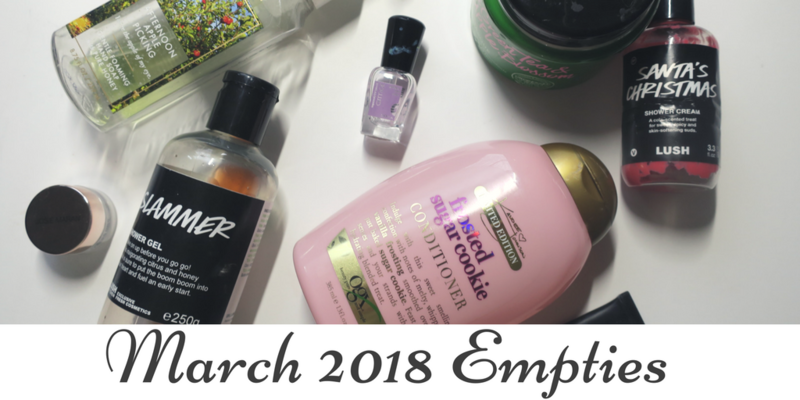 This post feels less repetitive because I didn’t do a yearly empties post, that would have been strange if you ask me, so instead I’m just doing the one. Last month was a pretty normal amount of products used up for me, however, this month is a little bit light, I just didn’t focus on as many products nor did I use up as many I guess, but I’m still going to share so let’s dive on in.